Singing My Way Down The Tucson Trail, and Pokey. Tucson Trail is one of 5 songs in the final running for Western Song of the Year! "Bass and vocals. Native Texan. My favorite songs are about Texas and all the natural beauty we enjoy who are lucky enough to live here." "I sing harmony, lead, write cowboy songs and play lead and rhythm saddle guitar. I hope you enjoy good clean western music from where the coyotes are howlin', if so, you'll love Prairie Moon." "Howdy Partner! I also sing harmony, write a little, sing some lead and play French Harp for Prairie Moon. I'm always wandering Way Out West in Texas under a Prairie Moon!" "I sing lead, write songs, and play rhythm guitar. I'm proud to be the oldest living member of Prairie Moon!" "I fiddle around a lot and occasionally put in a "hot" mandolin lick to round out that Prairie Moon sound!" 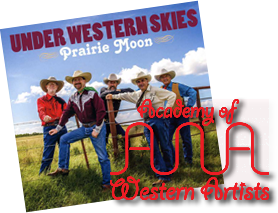 Prairie Moon�s new CD �Under Western Skies� now available. This page has been visited 76976 times.